Little, Brown Books for Young Readers, 9780316308465, 128pp. Archie Morningstar fights crime across the universe alongside his dad and Pockets the talking cat. 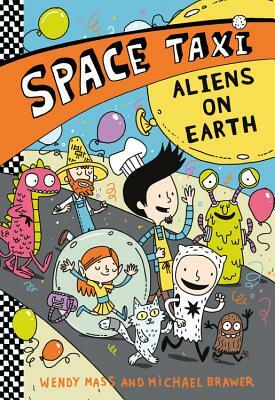 In his sixth adventure, the space taxi navigation system goes down, stranding all the alien passengers on Earth! Will the team be able to find hiding spots for these otherworldly creatures before they're discovered, or will this be the end of the operation for good? Get ready for another exciting intergalactic adventure. Wendy Mass has written lots of books for kids, including The Candymakers, a New York Times bestseller, Every Soul a Star, and Pi in the Sky . Michael Brawer is a teacher who drives space taxis on the side. They live in New Jersey with their two kids and two cats, none of whom have left the solar system.